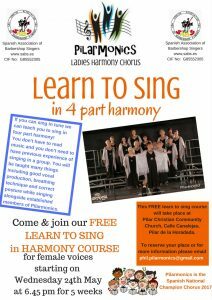 Description: Come & join this FREE Learn to Sing in Harmony course for female voices. It starts on Wednesday 24th May at 6.45 for 5 weeks. If you can sing in tune we can teach you to sing in four part harmony! You don’t have to read music and you don’t need to have previous experience of singing in a group. You will be taught many things including good vocal production, breathing technique and correct posture while singing alongside established members of Pilarmonics. If you’d love to let your inner diva escape and perform then please contact phil.pilarmonics@gmail.com to reserve your place.